Welcome to the natural drama of the northern hill country. The award-winning countryside series, The Dales Diary, returns on DVD with presenter Luke Casey pulling on his walking boots once more to uncover more stories from one of world�s most breathtaking landscapes. From the wildness of the Yorkshire Moors and the majesty of the Dales to the romantic ruggedness of the Scottish Borders, Luke invites the farmers, craftsmen, artists and writers into your sitting room to share their tales of living and working in the countryside. 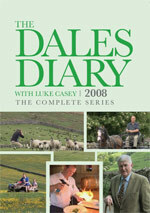 The Dales Diary entertained millions of suppertime viewers on ITV for 18 years, and you can enjoy another generous helping in this complete series DVD which features 10 half-hour programmes � that�s almost five hours of stunning programming. Relax, put the kettle on and enjoy a corner of Great Britain in which the values of a traditional rural life still hold true.